A prodigious talent, Luke Morahan is considered one of the most exciting young attacking backs in Australian rugby. 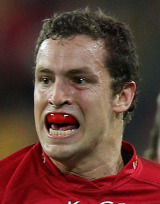 A product of the Reds Academy, Morahan made his Super Rugby debut for the franchise aged just 19, against the Lions in Brisbane in 2009. His season was cut short by a shoulder injury but he did enough to catch the eye of Wallabies boss Robbie Deans, who included the youngster in his squad for the end-of-year tour of Europe. Morahan repaid the Kiwi's faith in him by notching shortly after coming on as a replacement in the mid-week clash with Cardiff Blues. Morahan, who is also a noted Sevens player, made just six appearances for the Reds in 2010 but underlined his undoubted star potential by scoring a game-winning try against the Chiefs in what was his first start of the season. In October 2010, he was again called upon by Deans for the Wallabies' end-of-year Tests and he now looks poised to earn his first Test cap.